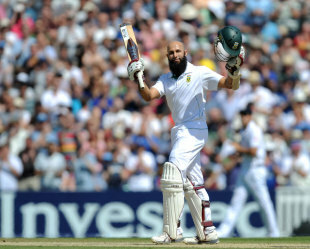 Graeme Smith, South Africa's captain, praised an "incredible" innings from Hashim Amla and the exemplary performance of his bowlers after a difficult first day, in condemning England to a huge defeat in the first Test. Smith, playing in his 100th Test, led his team to a victory that puts them 1-0 in the three-match series and takes South Africa a step closer to the No. 1 Test ranking. The tourists had been lacking something on day one, when England racked up 267 for 3, but roared back to dominate the rest of the match. "It's an extremely proud moment for all of us," Smith said. "To achieve a victory in what is the first Test of what is a big series, and play as well as we have ... in the context of the first innings to come back and win the game is an incredible achievement. "I don't think we were that terrible on day one, we lacked maybe a little bit of X-factor. We found that on day two, when maybe the conditions suited us. We found the intensity that maybe we lacked, we got a couple of plans right and all credit to our bowlers, they set the tone in this Test match and managed to finish it off on a really good batting wicket. "We felt coming into this Test that we were ready, we just needed to get ourselves into the contest. We managed to do that on day two, each player contributed, it was fantastic the way the guys played. I must give credit to Hash, it was an incredible achievement for him. A performance like that really means a lot to all of us and we're extremely proud of him." South Africa must win the series to regain the No. 1 spot they last occupied in 2009. The second Test begins at Headingley on August 2, with Smith hoping to confirm a first series defeat at home for England since South Africa's last visit four years ago. "We've got a batting unit that's been around for a period of time now, been successful in conditions around the world," he said. "We know we're going to Headingley and the conditions are going to be different. The team is very motivated to prepare as well for that Test match and understand it will be different at Headingley and we'll need to play a slightly different game. "We believe we've got the players who can adapt and mentally we've got a lot of experience of what we need to do to be successful there."